The liberals were right all along – the Constitution IS a living document! No, not in the way that Ruth Bader Ginsburg means the phrase – Scalia was correct in that originalism is still the only reliable way to interpret the law; and the conservative definition of “living” I still agree with, that it was built to be amended over time. Rather, the larger inference to be made is that the Constitution is fallible. It is not inerrant; it is not scripture. Perhaps it may be divinely inspired at times, but it is not gospel. At this point, you conservatives are scoffing “of course, we knew that”. But I want you to examine your behavior, your actions- do you reflexively recoil at the thought of abandoning the Constitution? 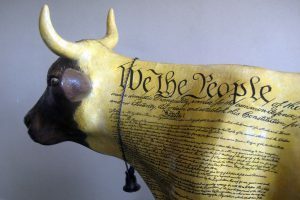 Do you operate as if you do believe the Constitution is sacred, infallible, and perfect? That all the words and ideas captured within it centuries ago are still perfectly applicable to today? I know I once did. Is the Constitution still the answer? I’m not going to go into detail on the actual parts of the Constitution which I believe may no longer be applicable to our present situation; instead I want you to focus on your unquestioning devotion to it. Was the Constitution made for the People, or the People made for the Constitution? Then why can’t they be an American in their own homeland? If they come here and don’t embody American principles, can we deport them? Can we deport natural-born citizens who don’t embody these principles? The question you are now forced to ask yourself is: are we, the current citizens of America, the same people and Posterity for whom the Constitution was written? Unequivocally no. We have had 60 million immigrants in the last 50 years alone. We are no longer the same people for whom it was written; this Constitution is no longer for us. Therefore, mindless devotion to the Constitution is, at best, misguided, and at worst, suicidal. I used to be of the mindset that “Oh, if only we could get back to the Constitution and the Rule of Law, then everything would be perfect again!” But reality keeps denying that dream, over and over again. We are a different people; we are not the Posterity that the Constitution was written for. Entropy takes its toll on all systems, including political and social ones. The decay of the Rule of Law is current and constant. If the best defense of an ideology is that it’s not implemented correctly, then consider the possibility that it can’t be. The Constitution no longer matches the People. Now, I believe the Constitution is still worthy; an ideal we should strive to. It no doubt provided the foundation for the most stable and prosperous government in all of recorded history. But we have lost our way. In order for the Constitution and the People to function in harmony, there’s two ways that can happen: The Constitution has to adjust to the People, or the People to the Constitution. The leftist modus operandi has been to adjust both the Constitution and the People, and they have been very successful at it over the past century. They did not like the Constitution they had, so they changed the People via immigration, so that the new People would allow them to rewrite the Constitution as they saw fit. The conservative belief that the tenets in the Constitution are still the best way is a good one to have; but we have not now the People to fulfill it. The only solution to this is to begin to restore the People that the Constitution was written for. Now don’t be ludicrous, i’m not proposing any ethnic cleansing. Rather, we must deport all illegal immigrants, prevent further illegal immigration, turn off the immigration magnets, strictly reduce legal immigration, stop and revoke birthright citizenship, and restore the Rule of Law – for starters. When we have the right People, then we’ll have a working Constitution. legal immigration must also be strictly limited. Even if we could impose an ideological conformance on immigrants, the fact of the matter is that most immigrants, having been raised in a foreign culture, will tend to favor the same principles that govern the cultures they emigrated from – and for current immigration trends, this means cultures incompatible with Western Civilization. We see this in a micro scale with Californians who emigrate to leave behind the onerous state government, only to turn around and vote for the very same propositions that ruined California in the first place. Immigrants are a foreign antibody that needs to be introduced in small doses in order to ensure the survival and integrity of the host organism. Because of the degradation of the Rule of Law, and the impotence of the Constitution, I am no longer concerned with the ideological purity of our elected officials. At this moment in American history, we must focus on GOALS, NOT TACTICS. Every dirty trick the liberals use, conservatives should use and respond in kind. Some would argue that this makes us no better than the opposition. Preposterous. To paraphrase Sir Sean Connery, “Looshers alwaysh whine about tacticsh. Winnersh go to Warshington and f*ck the opposhition implement their objectivesh.” Saul Alinksy, patron saint of modern-day liberal activists, put it this way as his #4 Rules for Radicals: “Make the enemy live up to its own book of rules”. How do you get the enemy to stop using mustard gas? Use mustard gas on them! Capital-C Conservatism has had 60+ years since Russell Kirk nailed his Conservative Theses to the GOP door; but in that time, the Conservative movement has conserved nothing! We are undeniably less free today than we were 60 years ago, by every conceivable metric. This realization hit me like a ton of bricks, and is the reason why I now call myself a recovering conservative. Conservative ideology has gained us nothing. The conservative politicians we elected to Congress are nothing more than principled and perpetual losers. The Conservative movement is nothing more than a minor delaying action, slowly but surely rubber-stamping every leftist proposition. So I don’t care if Donald Trump isn’t a conservative. I don’t care if he’s got the correct ideology. I don’t care if he’s wishy-washy on current conservative principles. You know what isn’t, but should, be a conservative principle? WINNING. All I care about Trump is: Can he help us achieve conservative goals? Can he help us restore the Constitution? Yes, by helping us restore the People the Constitution was written for. Can he help us restore the Rule of Law? Yes again by the above point, but also by giving us the only possible way to indict the Clinton crime organization. It’s all down to immigration, folks. Some say it’s already too late; Arizona and Texas will soon be majority immigrant, and thus solidly Democrat- and when that happens it’s game over for conservatives. But I choose to hope. I hope that Trump wins, and that he keeps his promises. I hope he builds a wall, I hope he deports illegal immigrants, I hope he appoints conservative Supreme Court justices. I know Clinton will do none of these things. So, I must hope. I must hope. Because as a second-generation American citizen, I was born into a time of American optimism, and I want to secure for my posterity the same blessings and acceptance of the founding principles of America that I was given. Ironic, isn’t it, that i’m calling for less immigration even though I am a direct beneficiary of it? Ironic, but not contradictory. Open the borders and you won’t have the same America any more- it’ll just become like the country of whatever group of immigrants that the most power. In fact, I would be willing to support disenfranchising all immigrants and their progeny to the 4th or 5th generation, even if that means disenfranchising myself. I am right? Wrong? Share and discuss! This entry was posted in politics and tagged Conservatism, Trump by Phil Chuang. Bookmark the permalink.